Obituary – Maloch, Harold Arthur « Perry High School Alumni Association, Inc.
Graveside rites will be in Grace Hill cemetery at 4 p.m. Thursday for Harold Maloch, 59, of Tulsa, who died in a Tulsa hospital Tuesday. Funeral will be at 12:30 p.m. Thursday at Moore’s funeral chapel in Tulsa. Newton funeral home is in charge of local arrangements. 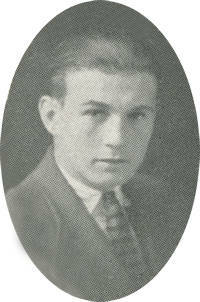 Maloch was born February 9, 1910 in Oklahoma City to James Edward and Margaret Jane (Lord) Maloch. He attended Perry schools in his youth. He was owner of the Maloch Oil Well Servicing and Drilling company. Survivors include his wife, Waudine, Hobbs, N.M.; two daughters, Mrs. Richard Renert and Mrs. Robert Lowrey, both of Albuquerque,. N.M.; his mother, Mrs. Maggie Maloch, Tulsa, and two sisters, Mrs. D. W. Leehan and Mrs. J. W. Roark, both of Tulsa.